The word is he will offer Democrats a deal crafted by his son-in-law Jared Kushner in which he would often on anti-immigration policy in exchange for his full $5.7 Billion wall money…. I DO think they CAN give him money for ‘border security’ and a ‘wall’ that would consist of ‘soft’ hardware like sensors and fencing along with more money for humanitarian efforts for those being held for short periods of time like children…. 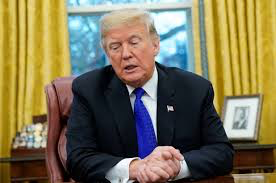 This first serious compromise offer from Trump comes as his polling numbers continue to drop in the 29th day of his trying to leverage HIS way against Democrats who have stood strong behind Democrat Speaker Pelosi and some Republicans have begun to join the Democrat’s….Trump has begun to understand that the midterm election resulting in a House Democratic majority has changed the playing field for him…. Democrats and Senate Majority leader McConnell are wary of Trump, who often listens only to media rightwingnuts, NOT anyone else…. Jared Kushner and Mike Pence have led the crafting of this deal and the negotiations with members, according to White House officials. Even some top Republicans are skeptical Trump’s overture will be enough to break the logjam…. His conservative supporters do not want him to do that for fear that Democrats could do the same thing in the future if they were in power….How will the conservative’s take a softening on immigration? Here is the Democrats giving what COULD be the Democratic move I mention above…. “The proposal to include more spending on border measures is scheduled for a vote next week… The plan reflects a shift in strategy by congressional Democrats, who have maintained that they would not give the president a counterproposal until he drops his insistence on a wall and signs legislation to reopen the government.”…. I will make sure i’m Not watching him….